The Cherry Creek Fire Department takes great pride in being an important part of the community. Every year the department participates in the Muscular Dystrophy drive that is held throughout the Valley. 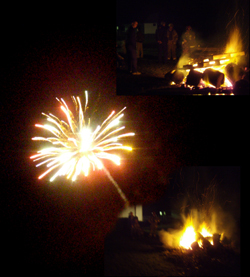 The department also helps the Cherry Creek Community Hall with the Halloween party by providing the bonfire to help keep the trick-or-treaters warm. The fireworks are also set off by the fire department. The members drive around on Halloween to help out where needed and to make sure that the community is safe while trick-or-treating. 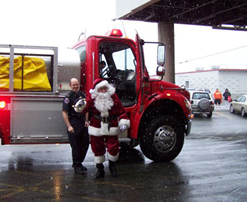 The Cherry Creek Fire Department has had the privilege to be able to deliver Santa to the local department stores to the delight of all of the anxious girls and boys. We look forward to helping out in the community for many years to come.